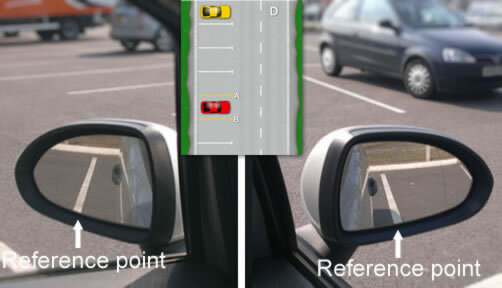 Accuracy – To successfully park in a bay within the lines and not too close to a car on either side. Control – By keeping the cars speed under control by use of clutch control and by use of effective steering. Observation – Constant all-round observation throughout the bay parking manoeuvre. Although there are several techniques that can be used for teaching the bay parking manoeuvre, this technique is one of the easiest. As you pull alongside the bays to the point of turn, as suggested in diagram A in the bay parking tutorial, the point of turn line will need to be lined up in the centre of the passenger side door. When you steer full left lock, it will guide you into the 3rd bay from this line. This reference point may need to be altered slightly for different makes of cars. Reference point A is the most important reference point in bay parking manoeuvre. If this initial reference point is not accurate, the entire manoeuvre is not likely to succeed. This tutorial assumes you are reversing into a bay on your left. If you are reversing into a bay on your right, simply substitute ‘right’ for ‘left’ in the description below. As you begin to reverse on full left steering lock, you will see the line to the left of your bay start to appear in the left wing mirror. Keeping a check on this will allow you to establish that you are going into the bay correctly. 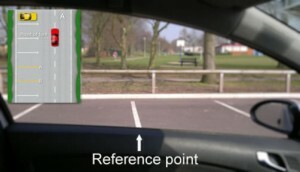 Sit upright to get the best possible view of this reference point whilst reversing. A little later as you are reversing on full left steering lock, the line to the right of your bay will appear in the right wing mirror. Again, sit upright to gain the best view and keep checking between the two lines. 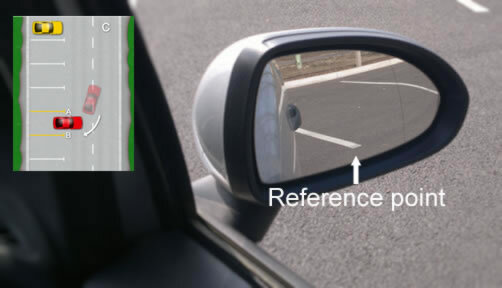 You will know when the car is straight because both lines in both wing mirrors will be parallel to your car as in the picture. As soon as they become parallel, ensure you briskly straighten the steering wheel. 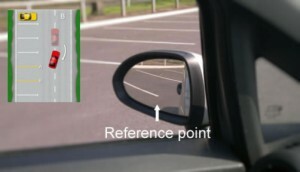 To know how far you should go back before stopping, you can use the junction line reference point as a guide. Using the junction lines reference point will put you sufficiently back in the bay without fear of hitting the kerb or wall at the rear. If there is no line joining the individual bay lines, imagine where it would be and use that. If during the bay parking manoeuvre you have over shot a reference point or when finished, you think you are not within the bay lines, explain to the examiner that you are going to pull forward (perhaps into the bay opposite) and reverse again. Providing you do it safely, an extra shunt is allowed! Note: this is just one bay parking technique that works well. There are other techniques, but providing you do the manoeuvre safely by keeping the car slow and do plenty of all round observations, it doesn’t matter which technique you use. It is often thought that you must finish completely straight and parallel with the lines in the bay and in the centre of the bay between each line. This is not the case. It is fine to finish at an angle in the bay and not straight. Providing you are in the bay lines, then all is good. If the examiner isn’t sure you are within the lines, they will exit the car to check. The manoeuvre has to be completed in a single move without adjustment. Again not true. As you are reversing towards the bay and feel it is going off-course, they are more than happy if you pull forward to correct.